Welcome Barbra Streisand, it’s so nice to finally have you here where you belong. You looked swell Barbra, more than 10,000 fans could tell that on Saturday night when the superstar appeared at Scotiabank Place, the fifth stop on her 12-city North American tour. Streisand visited Ottawa back in the 1970s on the arm of former prime minister Pierre Trudeau, whom she dated at the time. She almost performed here in the early 1960s when, as an unknown, she was booked to play the legendary Cafe Le Hibou. But after she won a major role in the Broadway show I Can Get It For You Wholesale, she bowed out of the Ottawa gig. So, 51 years later, Ottawa music fans finally got their chance to see Streisand on their home turf. After a nearly three-hour powerhouse show — with intermission — that included a stunning catalogue of her biggest hits, film clips, and support performances from trumpeter Chris Botti and Italian teen singers Il Volo, it was more than anyone could have ever imagined. The concert was blessed by the sound of the memorable music that has made Streisand one of the most beloved singers in showbiz. She rolled out more than two dozen songs and in a masterful performance, including songs from her Broadway successes and films, including People, Funny Girl, The Way We Were and Evergreen. Streisand was superlative, dazzling the eager Scotiabank crowd with her majestic vocals and engaging personality as she joked with the audience, and even took a few Q&A questions. And there was another Ottawa connection to the show; local choir, Big Soul Project got the thrill of a lifetime show when the 156-member of the gospel, soul and pop choir appeared on stage and sang with Streisand. After a montage of family photos from her Brooklyn years, Streisand opened with Being Good Isn’t Good Enough from her new CD Release Me but it didn’t take long to get in the Ottawa references. She talked about coming here in 1970 with Pierre Trudeau and adding very casually that Justin came to her Montreal show this week. “He’s so full of progressive ideas,” she said, adding Justin could soon be moving into 24 Sussex Drive. She got some good pre-advance coaching too, because she mentioned that Ottawa has neighbourhoods like her native Brooklyn, such as Hintonburg and Westboro, and that we have Beavertails. Streisand even suggested calling them Obamatails after his visit to Ottawa several years ago. Dressed in a black-sequined gown, Streisand was regal and commanding on stage. And in fine voice too. Whether it was belting out A Woman in Love and I Finally Found Someone or the magnificent weepie The Way We Were, Streisand was simply dynamic and captivating. She introduced Il Volo and they collaborated on a powerful version of Smile and she even traded Italian barbs with the teenagers. She ended the first half of the show with a Jules Styne medley that included Some People and Don’t Rain on My Parade that left the crowd begging for more. The 70-year-old was born in Brooklyn and over her career on stage, screen and in song has won two Academy Awards, eight Grammys and five Emmys. In addition, she has picked up a Daytime Emmy, an American Film Institute Award, a Kennedy Center Honors Award and a Peabody Award. She has sold about 140 million albums around the world and is the best-selling female artist on the Recording Industry Association of America’s (RIAA) Top Selling Artists list. After appearing in New York City clubs, she made her mark on Broadway appearing in Funny Girl where she introduced two songs, People and Don’t Rain on My Parade that have become closely associated with her. She later played the title role of Fanny Brice in the movie version which also starred Omar Sharif. She won her first of two Best Actress Academy Awards for that role. She went on to star in a number of popular films including Hello Dolly, The Way We Were, co-starring Robert Redford, What’s Up Doc and A Star Is Born. In later years she also turned to directing and producing movies and directed the dramas Yentl and The Prince of Tides, which starred Nick Nolte. Streisand’s latest album Release Me, is a collection of songs she recorded in the 1960s, 1970s and 1980s. It also includes the new song If It’s Meant to Be, written by her longtime friends and collaborators Marilyn and Alan Bergman. She is also readying a new duets album which should be released next year. Streisand has practically done everything in show business, but she had never performed in Brooklyn until Oct. 11 when she delivered a three-hour concert at the new Barclays Center. Her current tour winds up Nov. 11 in Los Angeles. In addition to Ottawa, the other Canadian dates on the tour include Montreal, Toronto and Vancouver. Legendary singer Barbra Streisand showed 10,000 fans at Scotiabank Place Saturday night exactly why she has been one of the best pop singers in the world for the last 50 years. After a quick video retrospective of Streisand from childhood in Brooklyn to Funny Girl and beyond, Streisand emerged wearing a long, black sequined dress, singing Being Good Isn’t Good Enough, the lead track from her new album Release Me. Backed by an orchestra made up of members of the National Arts Centre orchestra, she sounded great, articulate and strong. “Ottawa brings back a lot of memories,” she quipped, as if reminiscing about the time she dated then-Prime Minister Pierre Trudeau. “Oh, you’re laughing already,” she said, embarrassed, but not before saying how much she admired his son Justin. “Perhaps you’ll see him at 24 Sussex Dr. in a couple years,” she said while the audience, not sure how to react to her famously liberal ambitions, shifted restlessly in their seats. It was cute. 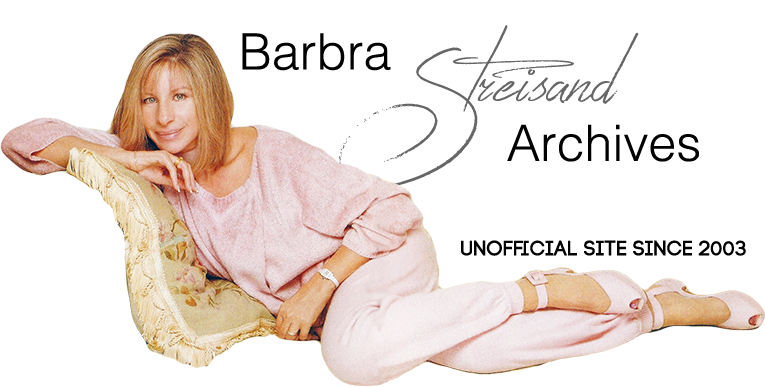 Suddenly, Streisand, who already appeared comfortable and showing no signs of the stage fright she’s battled for years, felt downright cuddly. From that point on, the vibe between Streisand and her Ottawa audience was so intense, it didn’t really matter what she sang or musical direction she took, everyone here tonight would follow her whether she tossed off classics like Nice ’n’ Easy and Rogers and Hart’s Bewitched, Bothered and Bewildered or Smile with the Italian trio Il Volo, outshining the youngsters with her astounding vocal range and faultless technique. While taking a break, to get the boys some snacks, she joked, they gave the fans a sample of their pop-opera hit O Sole Mio/It’s Now or Never. Then, sitting at a bistro table decorated with white roses, Streisand proved to be a good sport, with a sharp sense of humour as she answered questions from the audience and singing snippets of her hit Woman In Love. Accompanied by an orchestra, she reminisced about her friend Marvin Hamlisch, who wrote The Way We Were. Streisand underscored her affection for French Canada with a bilingual version of Jacques Brel’s If You Go Away and another duet, this time with trumpeter Chris Botti on What Will I Do/Funny Valentine and Evergreen. Then, like a good mother, she turned the microphone over to her son Jason Gould, an aspiring soul singer who didn’t embarass himself on a duet of How Deep Is The Ocean with his mother and a solo on This Masquerade. I am not sure if Gould has inherited his mother’s gift. That was clear when la Streisand sent the fans into a state of rapture with one of her defining songs, People and the Shirley Horn tune Here’s To Life. Later, accompanied by a large choir, Streisand and company closed the show with Make Our Garden Grow and Somewhere. For her encore, she was joined by her sister, Roslyn Kind on a round of Happy Days are Here Again. As concerts go, Streisand’s was truly exceptional. Intimate, yet on a grand scale, only she could do a concert that was small enough to feel personal, yet big enough to feel like a Broadway musical. While it was clear she was on a tight script, it didn’t feel phony. The pace of the show was relaxed, and the mood was surprisingly mellow. It took her nearly 2-1/2 hours to cover 20-plus songs. Meanwhile there was that voice. While it has gotten huskier with age, it is still a dangerous emotional weapon, one still capable of reducing the listener to tears. Streisand’s concert was so thoroughly enjoyable, that even Scotiabank Place, with its reputation for bad sound, sounded great, proving that Streisand can make any virtually any song, or any hockey arena, sound like a class act.